As the holiday season is in full swing, like the other holidays, Thanksgiving should be a time for family and friends to get together. However, when making your plans, please consider your dog(s). First, if you are planning to travel over the holiday weekend and plan to board your pet, start making the calls as soon as possible. The holiday periods are the busiest for kennels. Most kennels require Bordetella vaccines to prevent kennel cough. Make sure that you have all your vaccine records when you first go to the kennel. If you have never boarded your dog, then you might want to consider leaving it in the kennel the first thing in the morning and come back that afternoon so it gets the idea that you WILL return. Be sure to leave your pet with some dog toys and provide the kennel manager with some of its favorite treats. It’s always a good idea to leave a towel with which you have rubbed on your arms and legs so your scent is there to comfort and reassure your pooch. Before you go there, always inquire about the food that is provided. Good kennel owners will be happy to have you leave a bag or cans of your dog’s food so its diet remains consistent. If it has a favorite dog bed, you may leave that too. If you aren’t sure of which kennel to use, ask around. You can check out the kennels through YELP online or visit them yourself. •	If you are having friends and/or family for dinner, please remember that while you and your children know the proper protocols for keeping your pet safe, your guests might not. Make sure that all visitors know the rules about keeping gates closed and secure, especially when the kids are playing in the yard. This goes especially for the front door. •	If your guests’ children aren’t used to being around dogs, they might not know that some things they do, like tease the dog by taking its toy away, or grabbing its tail, might make the dog aggressive and a fear bite could occur. 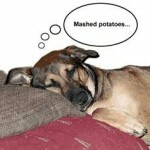 •	If you are making home baked bread or rolls, be sure that your dog cannot get to the dough. Eating bread dough could cause major intestinal problems for the dogs as yeast will rise inside your dog. If this happens, get your dog to an emergency vet immediately. •	Turkey bones, like chicken bones should NEVER be given to a dog. •	Between Halloween and Christmas, there is usually plenty of candy around the house. Make sure that your dog does not get any chocolate. Also, it is important to police the house and yard for candy wrappers which could, when swallowed, cause an obstruction. •	If you are travelling to a friend or relative’s house with your dog, find out where Emergency Veterinary Hospitals are along the way and in the community where you will be spending the holiday. •	Although the turkey skin is tempting to eat but you avoid it because of the fat content, you should not let your dog have it either. Overweight dogs have similar problems as people, including, stress on the heart, organs, and joints. as the fat isn’t good for it either. •	Ornamental corn is just as bad for a dog as are edible corn cobs. Be careful about all of your holiday decorations. •	Be sure that all food trash is disposed of properly and not left in a place where your dog can get to it. •	Remember: any food that is not a regular part of your dog’s diet can lead to intestinal problems. •	Thanksgiving costumes on your dogs might be cute to you, but are they safe for them to wear? If your dog is wearing a costume, does it fit properly? Can it get its foot or nail caught and cause injury or panic which could result in running loose and getting it caught on a fence causing serious injury? Is it weather-proof? Can it snag its nails on loose weaves in the material? Finally, is it necessary to make your dog wear it? Have a safe and wonderful Thanksgiving holiday…and make sure it is a safe one for your dog.